Balla Florist is owned and run by Judi Roche who has been working in floristry full time for the last 15 years. 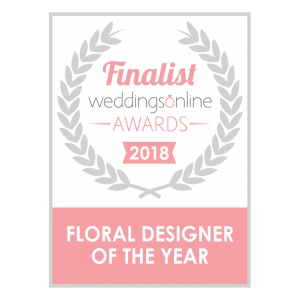 It is a privilege to be in this position- Judi has life long experience in floristry- And floristry has evolved so much in the last few years. 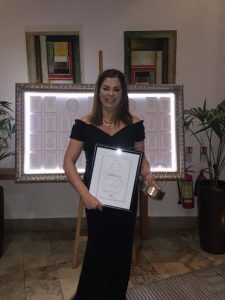 Attention to detail, organisation and being in touch are key to this very exciting industry and we are delighted to have been awarded with this fabulous accolade. This is not the first award we have won either! You can view a full list of all our awards to date over on : http://www.ballaflorists.com/wedding-flowers. 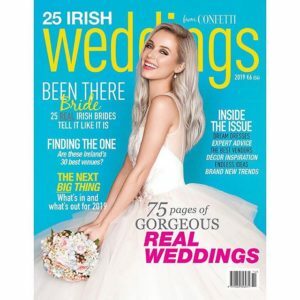 If you are planning your wedding and looking for something a little bit different then you’ve come to the right place. 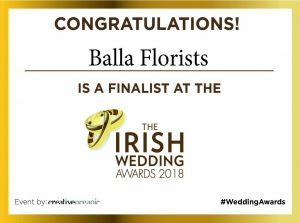 DressYourWedding.ie by Balla Florists are an Award Winning Wedding Florist who provide your bridal bouquets, corsages, hair pieces, Church florals and lantern hire services including red carpet, white carpet, Arch Hire, Milk Churns and so much more. We specialise in offering you an extensive range of beautiful vintage & rustic decorative items to decorate your wedding ceremony & wedding reception. 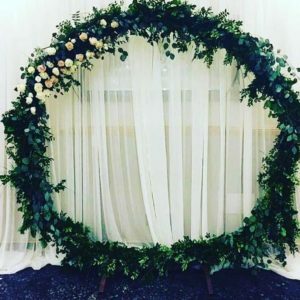 Our wedding décor items for hire include hand-crafted items, individually sourced vintage & antique pieces, a large selection of gorgeous glassware, candle holders, cake stands, lanterns, bird cages, signage, wishing trees as well as an extensive range Hire items such as post boxes, Love signs , flowerwall etc. We are also delighted to announce that we have this fabulous moongate available for hire soon! This would be a fantastic finish to any room. 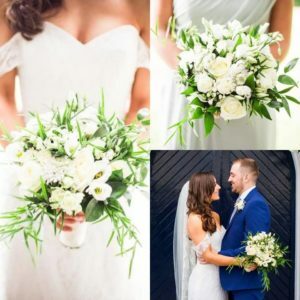 Head over to our dedictated wedding flowers website : https://dressyourwedding.ie/ to learn all about our wedding flower service today! Weddings in Mayo are definitely the busiest per head of population in Ireland. And we have some of THE BEST wedding suppliers & experts in the country. I cannot praise Mayo enough for its amazingly talented wedding professionals. If you are engaged a year prior to date! Start a wedding folder or binder. 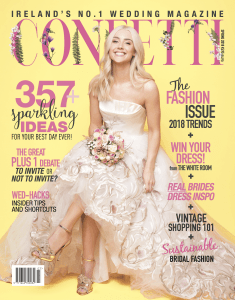 Begin leafing through bridal, lifestyle, fashion, gardening, design, and food magazines for inspiration. Determine how much you have to spend, based on your families’ contributions and your own. As soon as you’re engaged, people will start wondering who’s in. Hire a planner, if desired. A planner will have relationships with—and insights about—wedding suppliers. Reserve your date and venues. Decide whether to have separate locations for the ceremony and the reception, factoring in travel time between the two places. Research photographers, bands, florists, and caterers. Keep their contact information in your binder. Throw an engagement party, if you wish. But remember that your invitees should be on your wedding guest list as well. Hire the photographer and the videographer. No need to talk specifics yet, but be sure that the people you hire are open to doing the shots that you want. Attend gigs of potential acts to see how they perform in front of audiences, then reserve your favorite. If your wedding venue doesn’t offer its own catering service, look for one now and hire the service this month or early next. You’ll need to schedule time for at least three fittings. Veil shopping can be postponed for another two to three months. Reserve a block of hotel rooms (or other accommodation) for out-of-town guests. Pick three hotels (other accommodation) at different price points close to the reception venue for the guests to then book & pay themselves. Sign up at a minimum of three registries for gifts. Create your personal page through a free provider. Note the date of the wedding, travel information, and accommodations. Then send the link to invitees. Hire a calligrapher, if desired. Addressing cards is time-consuming, so you need to budget accordingly. Make sure that your passports are up-to-date, and schedule doctors’ appointments for any shots you may need. Allow at least six months for the dresses to be ordered and sized. Map out the ceremony and confirm that you have all the official documents for the wedding (these vary by religion). Reserve structural and electrical necessities. Book a florist. Maybe a year plus if a peak date. Florists can serve multiple clients on one day, which is why you can wait a little longer to engage one. Plus, at this point, you’ll be firm on what your wedding palette will be. Draw up a schedule of the event and slot in each component (the cake-cutting, the first dance). Book the rehearsal and rehearsal-dinner venues (if required). Negotiate the cost and the menu. If you’re planning to host a day-after brunch for guests, book that place as well. Check on the wedding invitations. Ask the stationery for samples of the finished invitations and revise them to suit your needs. Select and order the cake. Some bakers require a long lead time. Attend several tastings before committing to any baker. Provided you, ahem, know about the shower. Purchase wedding shoes and start dress fittings. Bring the shoes along to your first fitting so the tailor can choose the appropriate length for your gown. Schedule hair and makeup artists. Make a few appointments with local experts to try them out. Snap a photo at each so you can compare results. What should be playing when the wedding party is announced? During dinner? To kick off the dancing? Keep a running list of what you want—and do not want—played. Finalise the menu and flowers. You’ll want to wait until now to see what will be available since food and flowers are affected by season. Some safe bets: monogrammed cookies or a treat that represents your city or region. If you’re planning to have welcome baskets for out-of-town guests, plan those now too. Make a list of the people giving toasts. Which loved ones would you like to have speak at the reception? Ask them now. Determine what you would like to have read at the ceremony—and whom you wish to do the readings. And schedule your second fitting. Finalise the order of the ceremony and the reception. Print menu cards, if you like, as well as programs. No need to go to a printer, if that’s not in your budget: You can easily create these on your computer. This will give you time for resizing and engraving. Send your event schedule to the suppliers. Giving them a first draft now allows ample time for tweaks and feedback. Touch base again with all the suppliers. Make sure any questions you or they had in your first draft have been answered. Discuss specific shots, and walk through the locations to note spots that appeal to you. Review the playlist with the band or deejay. Though you probably won’t be able to dictate every single song played, you should come prepared with a wish list. The rule of thumb: Mail invitations six to eight weeks before the ceremony, setting the RSVP cutoff at three weeks after the postmark date. Submit a newspaper wedding announcement (if required). If you’re planning to include a photograph, check the publication’s website: Some have strict rules about how the photo should look. Arranging a night out with your girlfriends generally falls to the maid of honor. But if she hasn’t mentioned one to you by now, feel free to ask—for scheduling purposes, of course!—if a celebration is in the works. Enter RSVPs into your guest-list database. Phone people who have not yet responded. The process can take up to six days, but it’s good to give yourself some leeway. If you are changing your name, order several copies. Mail the rehearsal-dinner invitations (if required). Visit the dressmaker for (with luck!) your last dress fitting. For peace of mind, you may want to schedule a fitting the week of your wedding. You can always cancel the appointment if you try on the dress then and it fits perfectly. Now that you have a firm headcount you can order accordingly. Send out as many final payments as you can. Confirm times for hair and makeup and all suppliers. E-mail and print directions for drivers of transport vehicles. This gives the chauffeurs ample time to navigate a route. Draw out table shapes on a layout of the room to help plan place settings. Write the names of female guests on pink sticky notes and the names of male guests on blue sticky notes so you can move people about without resketching the entire setting. You’ll present them at the rehearsal dinner. Get your hair cut and colored if desired. Reconfirm arrival times with suppliers. Choose someone to bustle your dress, someone to carry your things, someone to be in charge of gifts (especially the enveloped sort), someone to hand out tips, and someone to be the point person for each supplier. Send a timeline to the bridal party. Include every member’s contact information, along with the point people you’ve asked to deal with the suppliers if problems arise. Or make arrangements for a delivery. Check in one last time with the photographer. Supply him or her with a list of moments you want to be captured on film. Set aside cheques/money for the suppliers. And put tips in envelopes to be handed out at the event. 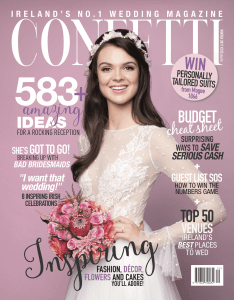 Send the final guest list to the caterer and all venues hosting your wedding-related events. Typically, companies close their lists 72 hours in advance. Assemble and distribute the welcome baskets. 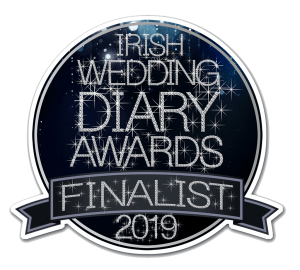 It’s that time of year again where we ask all our loyal customers to vote for us in the Irish Wedding Diary Awards! 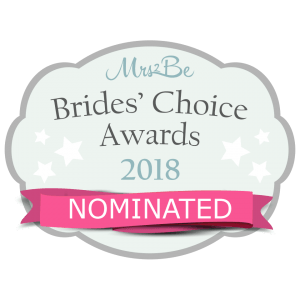 Please nominate and vote for us in the Wedding Florist category. Thank you for all your continued support over the years, we’re hoping to make 2018 our best year yet!